1908 a contract was let by the Swinton and Knottingley Joint Railway to widen the railway between Moorthorpe railway station and the colliery to two running lines. 1925 the Central Power Station was built at Frickley to provide power to both Frickley and nearby collieries. 1927 the output from the Frickley colliery was reported as 23,000 tons of coal a week, and the South Emsall Colliery 10,000 tons a week. 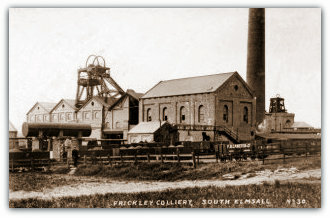 In a share prospectus the company said the life of Frickley was estimated to be over 100 years and South Emsall over 45 years. 28 December 1931 – Five colliery deputies died at Frickley after they walked into a pocket of gas. They were part of a party of seven deputies and an overman sent down the pit to carry out a safety inspection following the Christmas shutdown. At the time the colliery would employ between 3,000 and 3,500 men and boys but the pit had not re-opened and only 20 men were underground at the time. 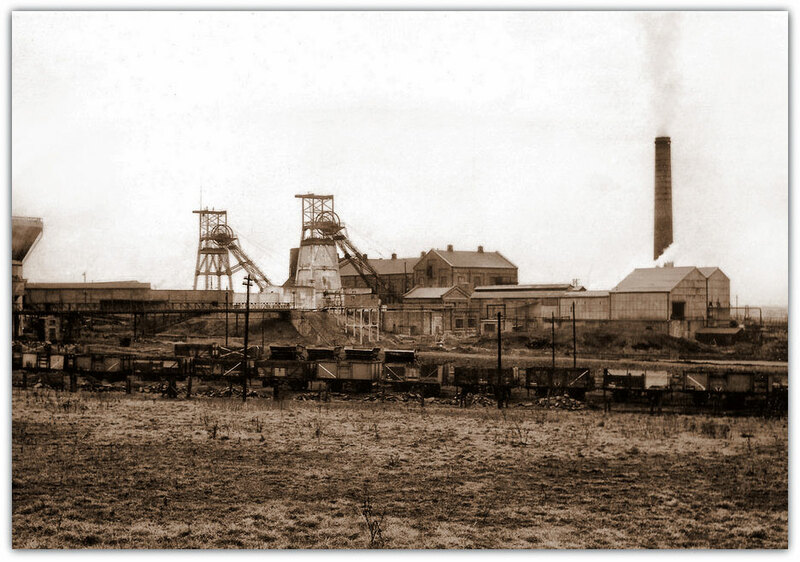 24 June 1933 – Following a heavy fall of coal and stone, one man was killed and another injured at Frickley Colliery. November 1934 – Following the dismisal of 300 men from Frickley Colliery eight thousand miners employed by the company in Yorkshire threatened to go on strike unless the company extended the work-sharing scheme. 1934 Longwall System replaced hand-got tub stalls. 23 January 1935 – A lighting strike at Frickley Colliery was called after the company employed a non-local man, although the London Times report that discontent had been developing since conveyor machinery was installed 18 months ago". 12 February 1936 – 2,500 miners walk out on strike over a dispute after a section of conveyors in the east side of the pit were changed, that would reduce the men required to work. A settlement was reached within a few days when the company agreed to the mens demands to re-instate the original system. October 1936 – The company encouraged non-union men and boys to join the Yorkshire Mineworkers' Association. 15 October 1936 – Three men are buried by a fall of coal on a conveyor unit in the east district. 28 December 1937 – An underground fitter killed in a fire and six other men treated for fumes, exactly six years to the day that five men were fatally gassed. 14 March 1944 – Due to a number of wage grievances, 3,000 men strike at Frickley Colliery, it is described as one of the biggest pits in Yorkshire. 5 August 1946 – Colliery is closed due a strike by pit deputies over sick pay. 1 January 1947 Colliery became part of NCB Yorkshire No.5 area. 27 August 1947 – Colliery is closed due to the workers going on a sympathy strike in support of action at Grimethorpe colliery four miles away. The sympathy strike also spread to other pits in the area. 5 February 1951 – The 3,300 men strike after objecting to a new "price list" for working the Shafton Seam and the transfer of men to other parts of the mine. July 1951 – The company tells the four hundred men working the Shafton Seam that they are at risk if production does not improve, it had dropped from an average of 71 cwt for each coal-face worker to 54 cwt since 1949. October 1961 – 2,000 workers are laid off for a week after a fire 2,000 feet underground has to be sealed off. December 1962 – A man working on a cooling tower at Frickley is killed after falling 40 ft.
2 April 1963 – Seven men are injured afet two diesel trains collide underground at Frickley Colliery, a runaway coal train hit another carrying 80 miners to the coalface. 1965 Colliery became part of Doncaster area. 8 June 1966 – An underground explosion in the 2,000 ft Barnsley Seam five miles from shaft caused the evacuation of 500 workers from the pit. Three men suffer burns. Rather than the traditional sealing of the area the National Coal Board successfully tried a new method of fire control by pumping three million gallons of water into the area. 1968 Rapid loading bunker for merry go round trains installed-one of the first in country. 1968 Frickley and South Elmsall Collieries merge under one manager. 1970 Cudworth Seam replaced Shafton Seam. 1977 New Baum Washery completed. 1984 Top Haigh Moor seam replaced Barnsley Seam. 1984–1985 Miners Strike – Frickley is known as "second to none" due to so few workers who broke the year-long strike.Following the strike the NCB announced they were reducing the workforce by 400 men from the 1700 employed before the strike. 1985 Colliery became part of British Coal South Yorks Area. 1986 Dunsil Seam ceased productions. 1992 Production commenced in Newhill seam. In its heyday in the 1930s the colliery employed 4000 men and boys and at is closure on 26 November 1993 735 men. In October 1992 Frickley/South Elmsall was one of the 31 collieries intended to be closed by the government. Given a temporary reprieve of just 13 months whilst studies showed the pit was one of the most profitable in British Coal, the miners were forced to vote on closure of the pit in a " No Win" situation in November 1993. Despite having plentiful and easily accessible reserves, the pit closed due to politics on 26 November 1993, leaving massive social and economic problems in the local area. Hi I wondered if you know if you can get a list of miners that worked at Frickley and their pit check number. My dad was a miner at Frickley.